We named this mechanics creeper the Rough Rider™ because it works great where no other creeper had gone before: outdoors and off the pavement! The Rough Rider™ is the creeper of choice for farmers, truckers, police, RVers, off-roaders, military technicians, auto enthusiasts, aircraft maintenance techs, and anyone else who have been forced to get outside and under vehicles in less than ideal situations. They like to call it the “off-road creeper”. The secret of the Rough Rider’s™ unmatched mobility on rough terrain lies in the unique shape of the one-piece molded body, which allows for the large, specially designed 5-3/8” diameter wheels and cradles the user just under 3” above the ground, which gives just the right amount of ground clearance for typical outdoor work sites while still being low enough to work comfortably. The extra wide 1-3/8” tires resist sinking in soft surfaces, and their large diameter allows them to roll easily over dirt, broken pavement, grass or even gravel with a firm substrate! Other creepers would get stuck dead in their tracks in such places. 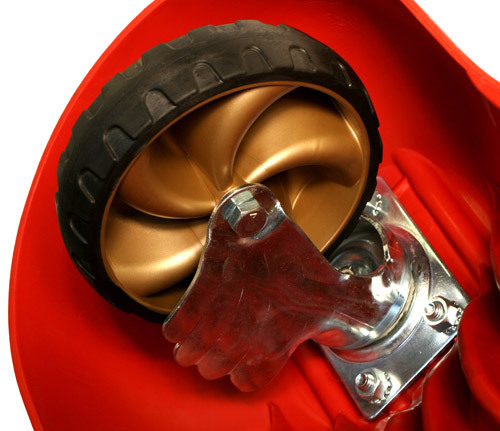 Each custom molded wheel has a heavy duty oil-impregnated sintered steel center bearing. The wheels are mounted to a heavy gauge steel caster frame with dual race ADJUSTABLE ball bearing swivels for strength where it counts! Like all of our products, they carry a limited lifetime warranty. 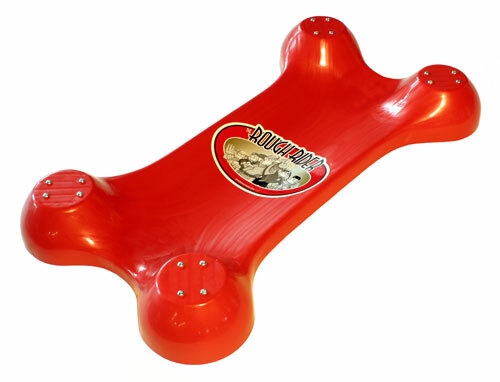 The Rough Rider™ shares its body with the original Bone™ creeper, being molded of a high tech engineering grade polypropylene copolymer that resists the effects of common solvents, oils and gasoline found in the shop. The body features special wheel pods mounted at the far outside corners, giving the creeper an extremely low center of gravity and eliminating the risk of tipping over. The shrouded wheels also won’t catch your hair and clothing! The 400 pound capacity, ALL AMERICAN Rough Rider™ is the number one choice for mechanics that need a go anywhere creeper to get the tough jobs done.